Photographer: Emma Summerton. Model(s): Mia Wasikowki. Source: Vogue Australia. Stylist: Jillian Davison. Makeup: Linda Jefferyes. Hair: Sophie Roberts. Fashion meets art with Mia Wasikowska by Emma Summerton for Vogue Australia, March 2014. 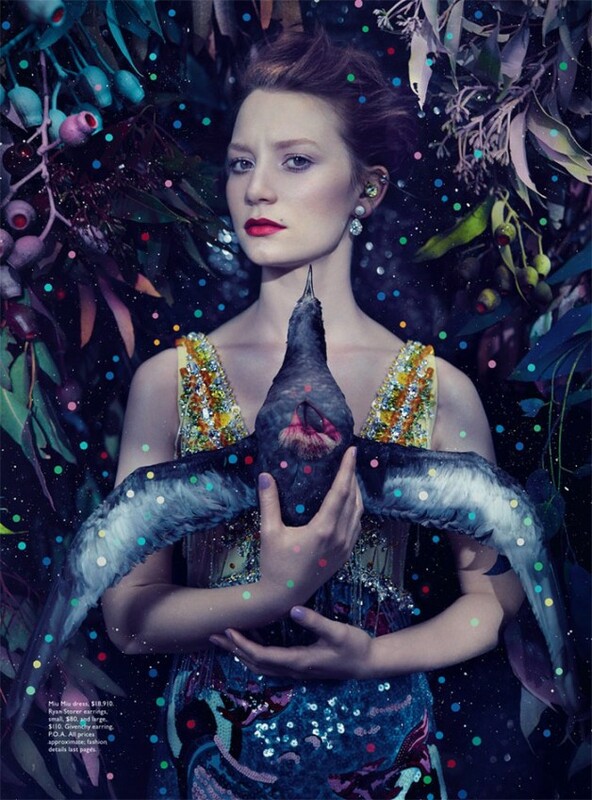 Mia Wasikowska captures our imagination in this stunning array of fashion & play. We visit the outer spectrum of decadent desire as we master the effects of joyful anticipation. A multi-layered mix of color & magic, (Makeup Artist) Linda Jefferyes captivates our senses in a dream-like state of wistful wonder. Wearing elegant wears, (Stylist) Jillian Davison matches the surroundings with dresses that speak to another dimension. Lost in a medley of beauty and show, (HairStylist) Sophie Roberts, creates a coiffed dew that’s topped-off with a head-dress of perfectly, placed orange feathers. Sprawling, magnificent, evocative and real, the color comes to life in this hyper-vivid mix of fashion and fantasy. Crossing over in a spirited journey, Mia holds the bird in a triumphant finale.